Patras, Sacred Spring of Demeter-Well of Saint Αndrew. Copperplate from the edition E. Dodwell, «A Classical and Topographical Tour through Greece», London 1819. The 30th of November is the feast day of Peter the Apostle’s brother Andrew who was also called Protoklitos (the First to be summoned by Christ), patron saint of Patras where he was martyred. He is a popular winter saint whose feast falls on the last day of autumn. 1) The name of the Saint, particularly in its folk-etymology form. 2) Whatever was mentioned in the holy scripts as well as hymns to the saint heard by the people in church. 3) The date of his celebration in the calendar. Here it is worth noting that time in popular perception is not an abstract and mathematical concept, but is identified with its content and experience. Hence November is called Sporiatis (sporos= seed) because it is the season of sowing. 4) Various random historical events, such as the liberation of the city of Nafplion from the Turks on 30th November 1822. This is why Saint Andrew is also considered the patron of Nafplion. Villagers in both mountains and plains fear the month of November, that is why they give it the name of St. Andrew. The people in the Peloponnese and Epirus named the month of November “Aindria”. In Kozani, Thessaly, Thrace and Sinope in the Pontus, November is called “Andrias”. In Greek traditional culture it is usual for the months to be named after a saint, as for example, October is called “Aidimitriatis (the month of St Dimitris)”. The church has declared the day of Saint Andrew’s feast a holiday, which the agricultural populations of rural Greece kept with reverence and fear, believing that the Protoklitos “andrievei”, i.e. helps the crops to “sprout”. In Roumeli as in the rest of Greece, the feast of St. Andrew’s was believed to be an agricultural one and customs of that day were purely agricultural. On the saint’s feast day, so as to help crops grow, yield more fruit and have a better harvest, farmers would boil wheat, add sugar, raisins and walnuts and then have it blessed in church. Afterwards they would bring it home, where it was eaten by the family or handed out to friends and neighbours. On the day of the feast, polysporia (a mixture of grains) were boiled in Epirus, Acarnania, Thessaly and Thrace. In these regions, wheat was cooked to which sugar was added, raisins and nuts, and festive koliva (boiled wheat with various fruits usually consumed in funeral services), which were then distributed. These customs show the magic-productive effects of the season, when sowing has ended and germination is anticipated. In Nigrita in Serres, it was believed that crops sprout (“andrievoun”) on St. Andrew’s feast day. That was why polysporia were boiled. In Koniatsi ( today’s Evangelismos) in Elassona, boiled wheat, having been blessed in church, was distributed among the houses, for the souls of the dead. A more common offering for the same purpose were the so called polysporia, spores, bolia, bousbourelia, polykoukia, Bobola or sitaromageiria. The polysporia are boiled cereals mixed with pulses, namely a mixture of wheat, barley, corn, peas, chickpeas, beans and lentils. On the eve of the feast, they were taken to church to be blessed. Then they were eaten and some were distributed. In Damaskinia (old Vedyloustion) in Kozani, the locals went to church in the morning. That evening in every farm house, the housewives made lalangites (type of fritters).With a piece of the dough they made a cross on the ambari (storage crate) in the basement of the house, to ensure that supplies would always be plentiful. Along with the lalangites, housewives boiled a pot of polysporia in a corner of the fireplace. The oldest woman of the house took a dish with cooked polysporia and went out in the yard, where she threw some of it into the air three times –the number of the Holy Trinity–, saying: “May the crops grow this high”. Afterwards, polysporia were eaten and best wishes were exchanged. Lalangites were made primarily for the men to grow (“andriothoun”) as well as the other family members. The following day, early in the morning on the first day of the month, lalangites were given to the animals of the house, for them to grow as well. In Agraph, uncooked polysporia were taken to church, where they were placed in front of the iconostasis’ Oraia Pyli (central door) to be blessed by the priest. In Lykorrachi (old Loupsiko) in Konitsa, polysporia were thrown into the gardens for a good crop. In Aiani in Kozani, boiled wheat was thrown onto the tiled church roof by the priest after the service. In Eptachori (formerly Vourvoutsiko) in Kastoria, sporidia (seedlings) were boiled for “Bereket” (abundance). Before the seedlings were taken out of the fire, three spoonfuls of them were thrown at the house, for the crops to grow. In Tyrnavos, on the eve of the feast, the farmers lit one tall candle in their courtyard or barn in Saint Andrew’s honour, among their agricultural tools, plough etc. and wished for their crops to grow as high as the candle. In Magoula in Elassona, farmers’ families boiled the “pachida”, i.e. crushed wheat. In many parts of Greece farmers threw polysporia into their fields, to have a good harvest. In Farasa Cappadocia, a kourbani (blood sacrifice) was performed, slaughtering young cockerels to St. Andrew or “E Ntre”, as he was called, in a ruined chapel located outside the village. The element of sympathetic magic is present in the habit of the house’s oldest women throwing three spoonfuls of polysporia up into the sky, wishing for the crops to become as high, as well as the belief that boiled wheat, whose volume increases with cooking, will help crops quickly sprout from the earth. The polysporia of St. Andrew’s feast are not the only ones in the month of November. They are preceded by the polysporia of the feast of the Eisodia (Presentation of the Virgin Mary), when in church she is offered fine boiled wheat mixed with pomegranate brunches, raisins and almonds. The priest blessed them and the congregation ate them with delight. The polysporia of the Virgin Mary were also cooked at home, boiling in a pot with grains of cereals mixed with pulses. The polysporia of Our Lady, and those of St. Andrew, are not unrelated to Pyanepsia or Chytroi of antiquity. The Pyanepsia was a feast dedicated to Apollo, during which the god was offered the first fruits of the harvest. The name of the festival comes from the word pyamos (broad bean) and the verb “epso” meaning to boil. In Pyanepsia, every species of seed was cooked. A mixture was prepared and during the so-called “Chytroi”, the third day of the Anthesteria, a festival dedicated to the god Hermes Psychopompos (conductor of souls) and the dead. On that day, each home cooked various seeds in chytres (pots). None of the living ate the food intended for Hermes and the dead, whose souls, it was believed, would ascend to the upper world on that day. In Artotina in the mountains of Doris, the bride would throw a nail on the roof tiles to prevent the harmful effects of demons. In Vourvoura, Kynouria, the groom turned over the roof tiles of the bride’s house, and even cracked a few. In Vournika, Lefkada, the bride would propitiate the roof demons by throwing almonds, nuts and koufeta (wedding bonbons) onto the tiles. In Baousioi, Ioannina, the bride threw a glass full of honey or wine on the roof. In Cyprus, St. Andrew, or “Ai Ntrikas” as he is called, is considered the healer of the deaf, paralyzed and epileptic. Up to the fateful year of 1974, crowds of pilgrims, both healthy and ill, thronged to the saint’s monastery, located in the Karpasitiki region on the east coast. Many Cypriots took their children there to baptize them and give them the name of Andros and Androula, i.e. Andreas and Andriana. According to one tradition that comes from Chios, Saint Andrew, together with Saint Charalambos, is also considered to be an exterminator of the plague. It is said that he walked around the village of Chalkios at night, to protect the local people from the Black Death. In years gone by, on the day of Saint Andrew’s feast, tiganites (fritters) with honey were made everywhere. It was even believed that Saint Andrew pierced the frying pan of the housewife who forgot the custom. That is why one of the saint’s nick names was Trypotigana or Trypotiganiti (he who pierces frying pans). In the Patriarchate of Constantinople, loukoumades (donuts) with honey were offered to the congregation after the church service. The French traveller Guillaume-Joseph Grelot, who travelled in Greece in 1670, informs us that on Saint Andrew’s day, women were always making tiganites. 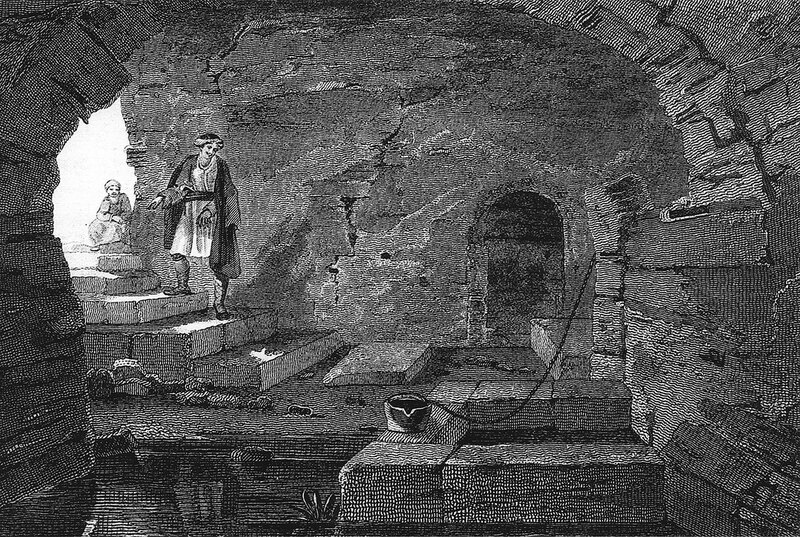 Today, clean water coming from the oracular spring of the goddess Demeter fills St. Andrew’s well, next to the austere Basilica designed by Lysander Kaftantzoglou, which is the “Old Saint Andrew” church of 1836, on the west coast of Patras. After the church service on November 30th, young lovers went to St. Andrew’s well and drank handfuls of water, to ensure their welfare. In earlier times, in the Patras area, on the eve of the feast of St. Andrew, lachanopites (cabbage pies) were made and sent to the church to be distributed among the poor. This was a custom of consoling and worshipping the dead. At the same time, i.e. early winter, farmers in European countries were making crèpes of wheat, for worms not to eat the young plants. These were for placating evil spirits. Another tradition from Patras says that seaweed was often found in the Saint’s cenotaph. This was because the Saint, who was a fisherman, helped fishing boats in danger during big storms. In places that were close to the sea, next to the great maritime routes and islets, Saint Andrew was considered the patron of fishermen and crews of small ships. This view was prevalent in Kimolos, Paxous, Ithaca, Astypalaia, Cyprus and the coast of Propontis. The association of the name of St. Andrew with the word “andras” (man) explains dream predictions on marriage that took place on the feast day. In Skyros, on the day of “Ai-Andrios”, young girls fasted so as to dream that night of their future husband. In the village of Chalkios in Chios, girls lit the candles in the chapel of St. Andrew, praying to him to arrange a good marriage for them. Many Saints are punishers, imposing punishments on people who do not observe the holidays and customs or are disrespectful. Punisher saints are usually the ones, like St. Andrew, whose feast falls on days critical for agriculture and animal husbandry. From the Chronicler of Dorotheos, a vernacular text of 1570, we learn that in a church situated on some Cycladic island, an irreverent priest used a spear to extract the right eye of Saint Andrew’s icon. Miraculously, at that same moment, out came the priest’s right eye and replaced that of the saint’s in the icon. -Saint Andrew how do you do? In winter where will you go? and treat you all to wine! In Mesara, Crete, on the 30th of November, carpets would be laid and heavy woollen bedding known as batanies, taken out of chests. Summing up all that was mentioned above, the Greek people believed St. Andrew to be the patron of farmers and crops, healer of the blind, deaf, paralyzed and epileptic and the plague’s exterminator. He was also patron saint of fishermen, the crews of small vessels, of lovers and young girls who he helped dream of their future husbands. Finally we should note that the knowledge and study of customs preserved and practiced mainly by women, help us understand the simple country people with their hopes, beliefs and fears about the visible and the invisible world surrounding them. Traditional customs are part of our cultural heritage. They constitute a palimpsest of the popular worship practiced by our ancestors, both ancient, Byzantine and more recent. Ambari: Wooden, lidded storage crate for grain, measuring 1.50×1.00×1.20m.The maker of the ambari opened a hole in its centre, that closed with a stopper. Directly under this hole, sacks full of grain were placed and sent to the mill to be ground. Each house had three ambaria in its basement; for wheat, maize and barley. Lalangites: Donuts, crispy fritters. The Byzantine lalangia. Traditional round sweets made of batter and fried in hot oil. After frying, they were placed in a dish and sprinkled with honey and walnuts. Served hot. They were made on saints’ days and the New Year. Bereket: Abundance of goods, wealth. Νychteria, aposperides, parakathia or vengeres: These were mainly women’s gatherings at home for entertainment. They got together, sang, worked-knitting, weaving, spinning or peeling maize- told tales, humorous stories, riddles, tongue twisters and tserefilika (daring, allegorical stories). Pachida: Crushed and boiled wheat. Polysporia: Cooked cereal mixed with pulses. A festive mixture, to which sometimes sugar, nuts and raisins were added. Polysporia are also called sporidia, bolia, Bobola, bousbourelia and polykoukia. Pyanepsia: Feast in the fourth month of the Attic calendar, known as Pyanopsion (October-November) dedicated to Apollo, to whom the first fruits of the harvest were offered. The Pyanepsia was linked with the procession of the Eiresione by young boys. The Eiresione was an olive branch wrapped in wool, on which fruits were tied. It was a symbol of abundance, which brought good luck to all the homes it entered. Koniatsi in Elassona: Today it is called Evangelismos. Settlement in Thessaly, NW of Larisa. Damaskenia in Kozani: In earlier times called Vedyloustion. Settlement in West Macedonia, on the slopes of the Askion Mountain. Lykorrachi in Konitsa: Its earlier name was Loupsiko. Settlement of Epiros, NE of Ioannina, on the slopes of northern Pindos. Eptachori in Kastoria: Its earlier name was Vourvoutsiko. Settlement of West Macedonia, SW of Kastoria. Artotina: Settlement in the mountainous part of Doris, on the slopes of the Vardousia. Vourvoura in Kynouria: Mountainous settlement in Arcadia, SE of Tripolis. Baousioi in Ioannina, on the slopes of mount Tomaros. Chalkeio. Settlement on the SE part of Chios. Burkert Walter, Αρχαία Ελληνική Θρησκεία, Αρχαϊκή και Κλασσική Εποχή, trans. Νικ. Π. Μπεζεντάκος – Α. Αβαγιανού, έκδ. Καρδαμίτσα, Athens 1993. Ήμελλος Στέφανος Δ., Αγίου Ανδρέα Λαϊκή Λατρεία, Πελοποννησιακά, vol. 19 (1991-1992), pp. 225-251. Λουκάτος Δημήτρης Σ., Τα φθινοπωρινά, έκδ. Φιλιππότης, Athens 1982, pp. 182-187 and pp. 200-203. Λουκόπουλος Δημήτρης, Τα γεωργικά της Ρούμελης, έκδ. «Δωδώνη», Athens-Ioannina 1983 (2nd ed. ), pp. 163, 171. Μέγας Γεώργιος Α., Ελληνικές γιορτές και έθιμα λαϊκής λατρείας, έκδ. Οδυσσέας,Athens 1988 (2nd ed. ), p. 35. Nilsson Martin P., Greek Folk Religion, University of Pennsylvania Press, 1972.